When I was going to college full time, I had a part time job and wasn’t making a lot of money. I didn’t want to take out a loan, so I tried to be as frugal as possible by managing my paychecks and paying for rent and food each month, and then saving as much money as possible so I could pay for each semester. You can read more about how I almost paid for college without taking out a loan here. It wasn’t easy. And there were months where I was barely scraping by from paycheck to paycheck and wasn’t able to put money into savings. After I married my husband and we had our first child, that first year when I was a stay-at-home mom was challenging as we went from two incomes down to just one. We had to figure out how to make it work each month to solely live off my husband’s paycheck, and there were some months where we barely had enough from our paycheck to cover all of the bills. Even though those were hard months, we luckily weren’t at the point where we were living paycheck to paycheck. If for some reason my husband was suddenly unemployed, we would still be able to meet financial obligations for a short time because we had savings. We didn’t want to touch that savings unless it was for an emergency because we knew that if we had to regularly dip into our savings each month to pay bills, we would soon find ourselves in an extremely stressful and difficult situation. So we found ways to live frugally. If you find that you can’t sustain yourself a few days without a regular paycheck coming in and you have to rely on each paycheck to manage your day-to-day life, then you won’t be able to plan ahead for unexpected situations that might occur, like a trip to the doctor’s office or a broken down car. You’ll end up using a credit card then have to work hard to try to pay it off. There are a number of reasons someone may end up living paycheck to paycheck. It could be an event outside their control or it could be a result of their own financial choice they made. Either way, it’s a stressful way to live. 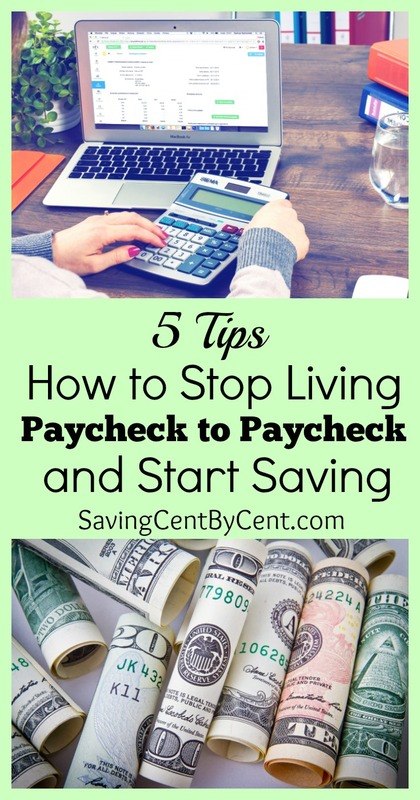 I want to share with you some tips on how to stop living paycheck to paycheck and start saving money. It won’t be easy. It will take dedication and determination, and you’ll have to make sacrifices along the way, but in the end it will be worth it. You won’t have the stress of debt or trying to come up with money for the things you really need or those unexpected situations that might arise. 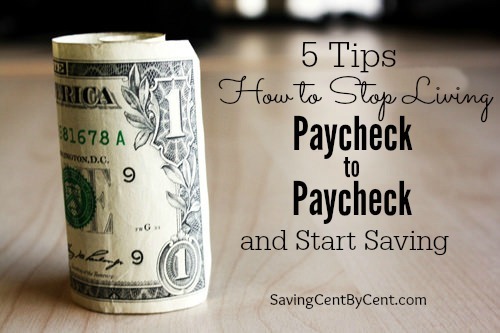 Here are 5 tips to get out of the paycheck-to-paycheck cycle. You need to first know what you are spending your money on before you can make the needed changes that will help you to stop living paycheck to paycheck. First, start by monitoring your spending for a short time by using a notebook and writing down each time you spend money, even if it’s only a few dollars. It’s these daily routines and variable expenses that are the cause of overspending. By writing down what you spend your money on, it will help you see where your weaknesses are so you can tighten down on them. Read more about How to Set a Budget here. Before each payday, set aside time and decide how you will spend that money. Be sure to list all upcoming bills and the amount due, and then place them in order by due date so you know which ones need paid first. Also, determine how much money you need for one week to cover items such as gas and groceries and anything else you may need. Take out the amount of cash that will get you through the week to pay for those things, and don’t use credit or debit cards. If you run out of cash during the week, review your purchases from the notebook and find out where you could have cut costs. Using cash will help you develop a mind set and help you think twice before purchasing something, even if that something is only $5. If you can’t pay cash for it, it’s probably not something you really need. Now that you know what you are spending your money on, cut out the expenses that aren’t necessary. A lot of times we spend money on items without thinking such as paying for cable, new clothes, Netflix, Internet, extras on a cell phone plan or that daily trip to the convenience store for a soda drink. Some people may think that these items are a necessity, but they aren’t. You would be able to survive without these things. Try taking the non-essential items you spend money on and cancel them for one month. Going without these items will help you determine if it’s something you really do need. You can also then take that extra money and put it in savings or use it to pay down debt. One way you can really get away from living paycheck to paycheck is to downsize. Lower your monthly car payment by getting a used or older car instead. You can read about how we paid cash for a new-to-us car here. Consider the possibility of moving into a smaller house. Doing these things will lower your monthly bills and eliminate some debt. If you aren’t spending as much on the mortgage or a monthly car payment it will allow you to place that extra money in savings. More ways to cut expenses are to reduce your food costs by cooking at home more and eating out less. If you are able to cut your food bill even just $25, it adds up to $1,200 in savings a year. Read about how I feed my family of 5 for less than $400 a month. Get rid of memberships such as gym or club memberships. Try to lower your home energy use by turning the thermostat down a few degrees in the winter or up a few degrees in the summer. One thing that many people living paycheck to paycheck waste money on is late fees. A $5 late fee here or a $25 late fee there can really start to add up. The best solution to avoid late fees and to move towards financial stability is to pay your bills as soon as they come in. Later on, you can begin to develop your own bill-paying routine. The way my family’s bill-paying system works is we pay our bills every two weeks. Once my husband deposits the paycheck, I sit down that day and write out all the bills that are due. With any extra money we have left over after bills and paying tithing for our church (and sometimes we don’t have a lot left over), my husband and I discuss how much extra we can put down on our mortgage, if there are any upcoming bills or expenses that we foresee in the next month, how much to place in savings and how much to add to our family vacation or Christmas cash envelopes. I’m grateful that my husband and I have an open communication about finances and that we discuss our financial goals. You can read more about how to Effectively Talk Finances with Your Spouse here. If you’ve reviewed your spending habits and you’ve trimmed your expenses and you feel that you are still just barely getting by, then look for ways to increase your income. Look around your house and find items you can sell on eBay, Craigslist or at a yard sale. Get a part-time job at another company or do freelance work outside of your day job. Consider starting a side business such as being a wedding photographer, cake decorator, interior designer, daycare provider, landscaper, tutor or walking dogs. Find something you can do and do it for a short time until you get a handle on your finances. If you arrange to have the money taken from your paycheck and put into savings before you receive it, then you will get used to managing living expenses with what looks like a smaller paycheck, and you won’t be tempted to spend it later on. Start by having your bank automatically put 5-10% of your paycheck into savings. If you feel like you can’t do that much then start smaller and slowly work your way up. The point is to start saving. It’s small changes that add up and give you more money to be able to pay for items you need, pay down debt, pay for unexpected emergencies, and build up your savings. What are some tips you have to stop living paycheck to paycheck and start saving?